There’s something noticeably different about “The B-Side: Elsa Dorfman’s Portrait Photography,” the latest from Errol Morris, as Elsa Dorfman leans over a counter to reflect on the portraits she’s taken over the years. A photographer who specializes in a particularly rare form of stills – the jumbo-sized 20” x 24” Polaroid, of which the company made only five cameras capable of taking such pictures – Dorfman can be seen sifting through her archives, with each snapshot summoning a different memory in an environment that’s entirely hers. This usually isn’t the case in Morris’ films, where the filmmaker has pioneered the use of the Interrotron, his signature device where two teleprompters allow for his subjects to stare directly into the camera, delivering expressions as precisely to the viewer as their words, giving the impression of unmediated truth when the process to get there is anything but. Yet in “The B-Side,” the lack of formality reflects the warmth and disdain for pretension of its subject and results in one of his most winning films to date. Though one of the least well-known people Morris has profiled in recent years, Dorfman is likely the one he knew most before making the film – in her stack of the family portraits that she’s taken to create a steady revenue stream over the years, you can see Morris’ smiling back to the camera, and like a master chef preparing a personal favorite, there’s a sumptuousness in the film’s simplicity, getting out of the way of all the good stories Dorfman has to tell. Despite her repeated insistence of being “a good Jewish girl,” Dorfman recounts how she unexpectedly fell into the cool crowd while serving as a secretary at Grove Press, forging a lifelong friendship with Allen Ginsberg since she oversaw the copy machine that he (ab)used to print out manuscripts. He introduced her to slang like “using the can” as well as his compatriots in the Beat Generation, putting her in a privileged position of being the only one permitted to capture Bob Dylan’s Rolling Thunder Revue tour or snapping iconic images of Anaïs Nin and Jonathan Richman, before learning of the large-format Polaroid camera set up in her hometown of Cambridge that would truly distinguish her work. Morris gets Dorfman to hold up many of these photos, her accompanying recollections illuminated by small bits of personal context – just enough about her husband Harvey and her son Isaac to underline her dueling roles as wife and mother as she pursued an unforgiving career as a working artist, and when occasional interviews she’s given over the years pop up, it gives as much insight about the cultural attitudes of the ’70s and ’80s as to her own personal philosophy towards the work she does. The dignity she gives her subjects is given to her in kind by the filmmaker, who aided by a gently noble and nimble score from Paul Leonard-Morgan finds the great virtue in her 30 years of taking photos of all walks of life, her portraits just as likely to be hanging in fine art galleries as in suburban homes. About midway though, Dorfman introduces the practice that gives the film its title, taking two pictures of everyone and allowing her subjects the choice of one to keep, with the artist occasionally finding “the B-side” more interesting in its imperfections. As a lighter film than Morris is accustomed to making, it would be a mistake to suggest how the film fits into his oeuvre is some kind of analogy, just as Dorfman herself bristles slightly when considering that she may be taken less seriously as an artist because her pictures often depict happiness. Although “The B-Side” is mildly mournful as Dorfman confronts her impending retirement, forced onto her by the death of the Polaroid film she uses, it is a celebration of the ability to freeze time and the pleasure of looking back. While both the filmmaker and subject spend time ruminating on the mortality of what they do as times change, it’s proof enough in how alive and immediate “The B-Side” consistently feels in conjuring the past that they need not worry if their work will endure. 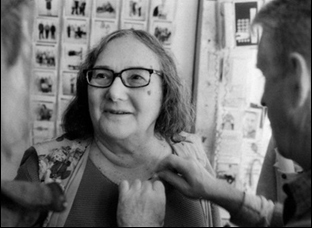 “The B-Side: Elsa Dorfman’s Portrait Photography” does not yet have U.S. distribution. It will play at the New York Film Festival on October 9th at 6 pm at the Walter Reade Theater, October 10th at 9:15 pm at the Bruno Walter Auditorium, October 12th at 9:15 pm at the Howard Gilman Theater and October 16th at 2:30 pm at the Francesca Beale Theater. NY Film Fest '16 Review: Only with Steve James, An Incomprehensible Injustice Adds Up in "Abacus: Small Enough to Jail"
Interview: Dash Shaw on Getting That Floating Feeling of "My Entire High School Sinking Into the Sea"